Why Fonzie Flats? 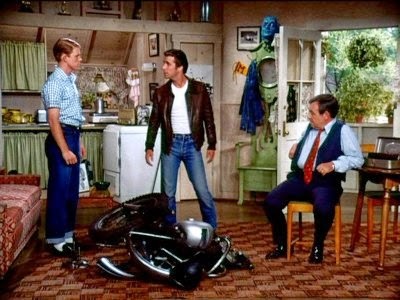 First of all, Fonzie lived in one. Secondly, it is catchy, fun, and is memorable. Most importantly, it helps to remind people that like Fonzie himself, Fonzie Flats are cool. They are cool for the person who finds an apartment that suits their needs, and they are cool for the homeowner who gets a revenue stream. They are cool for teenage offspring or elderly parents who want some independence and privacy but need to be near the family. They are a cool way to fulfill all of these needs without altering the visual character of the neighborhood. My current block has two, my previous block had a couple also, and I can tell you from experience that they're not a problem. My old block. Can you see the Fonzie Flats? They're there. The New York Times recently did a nice article on them that you should check out. In the classic book Suburban Nation, Duany, Plater-Zyberk, and Speck point out that having the homeowner on-site helps to keep the tenants on their best behavior, because very few homeowners will tolerate mischief happening literally in their back yard. Alan Durning of the Sightline Institute has also done a lot of great great writing on the subject, particularly on how to scale back regulations in ways that make Fonzie Flats easier to build. I understand and respect that single-family neighborhoods are sensitive to any sort of change, but we should keep an open mind toward minimally invasive changes like Fonzie Flats that can bring big benefits to the entire community without much disruption. Disclaimer: Just so we're clear, I'm not the first to use the term Fonzie Flat. I'm just trying to help it catch on. This post was definitely very interesting and informative, I had no idea such flats even existed to this was an eye opener, thanks! Hope to see more posts from you soon, keep it up!